Excavators or diggers play a key role in construction and landscaping. Excavating equipment is designed to dig and shift vast quantitiesof soil, rubble and other ground fill on a rotating platform. 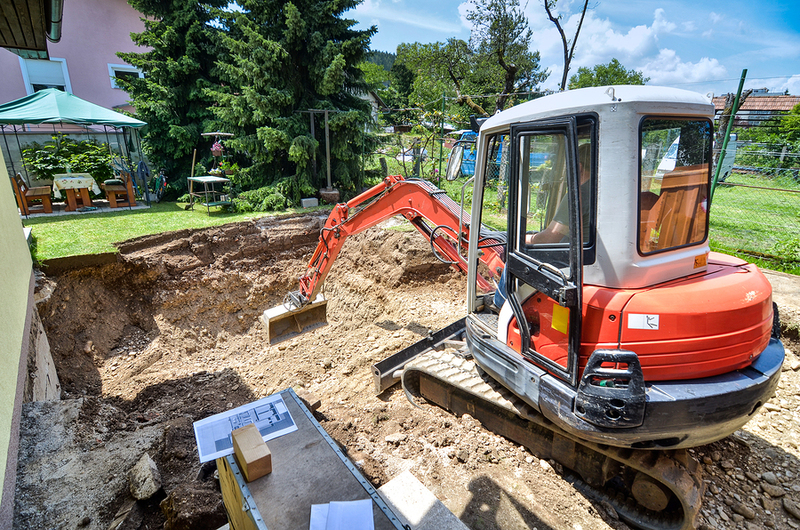 There are many factors to consider when choosing the excavating rentals you need and the feasibility of your dig and that is why it is important to seek help from experienced professionals who can help you make informed decisions about your project. Michiana Commercial Landscape offers services that are will help facilitate the planning and excavation process. Michiana Commercial Landscaping offers a wide range of services and are experienced professionals available to work with you on your commercial landscaping projects. Did you know that you need a license to operate excavating machines? It's important that you hire a licensed operator to conduct excavation on your property. Not only is this important for the quality of the services that you are provided with, but part of the licensing process is to learn about safety and best practice when operating excavating machines. A licensed operator will be able to assess the best approach to excavating earth and will be able to determine the best location to operate the excavating equipment. Excavating rentals are a great way to get the safe and professional services you need at a price that suits your project. A crucial stage when planning to excavate is ensuring that your dig site is safe and suitable for the landscaping you are undertaking. When you are moving large quantities of earth it is important to be prepared for not only foreseeable issues but also unexpected ones. Michiana Commercial Landscaping has the experience and knowledge to deal with any problems that might occur during the excavation process. That's why you really need to enlist the help of an experienced professional team that can not only safely and efficiently operate the excavating machines but can also assist you in the planning phase and troubleshooting issue that may come up during the dig. When you need to excavate on your property the right excavating rentals are essential. Michiana Commercial Landscaping can help you get the right excavating machines for your job. They have high quality excavating equipment help with your project. They will ensure that you are provided with safe equipment that will get the job done. If you use the wrong excavating equipment rentals it can delay your dig and blow out your budget. If you want to keep your project on time and on budget enlisting the best equipment and services to suit the task will save you time, money and give you confidence that the job will be done thoroughly, safely and in a timely fashion. Michiana Commercial Landscaping offers excavating equipment and services to suit your commercial landscaping needs. No matter the size, scale or requirements of the commercial project you are undertaking to enlist the services of the professionals at Michiana Commercial Landscape is the right choice for high quality, safe and efficient excavating rentals and excavating machines in your local area.